BL Healthcare proudly introduces the Healthcare Access Cart, the perfect low-cost solution to help reduce hospitalizations and improve the quality of care within skilled nursing facilities. 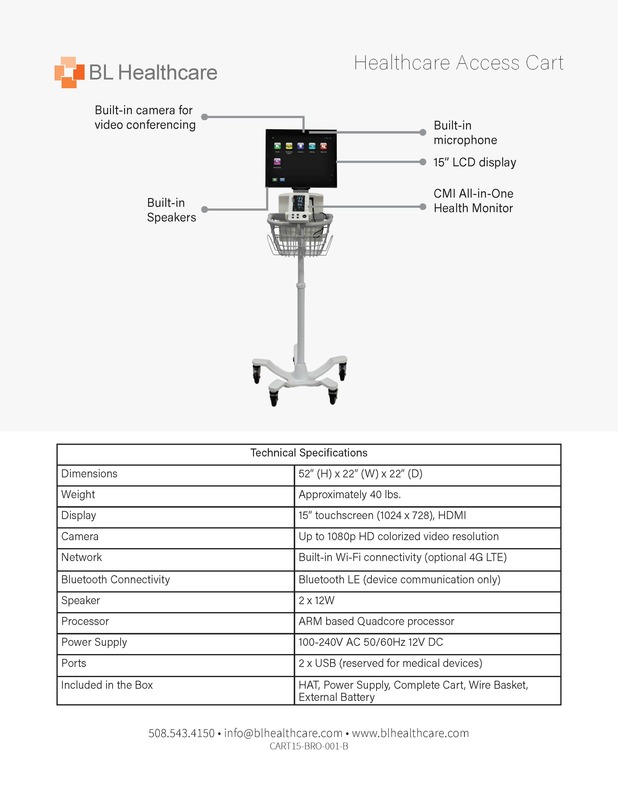 The Healthcare Access Tablet (HAT) is a standalone medical device featuring an interactive touch screen display and wireless vitals monitoring equipment. With all of the device’s capabilities pre-installed and built into the platform, simply plug it in and start connecting patients with providers from virtually anywhere! Our cart can be easily wheeled from place to place and includes an external battery for maximum portability. Reduce readmissions, avoid penalties, and maximize incentive payments. Treating in place has been proven to improve patient outcomes and enhance quality measures.